Ever crave a burger? Why not a lamb burger with the ingredients from the farm wonderful mint, and onions from White Pine Farm, the lamb from BF&E Organics (it is a very mild lamb). These all make a great lamb burger its been a big hit with our family (it is listed in the recipe section of this site) Try one and enjoy…We really enjoy them. Thank you so much for providing yet another wonderful meal for us. Combine lamb with mint, parsley, zest, onion, salt pepper in bowl. Mix gently until combined. Divide mixture into 4 equal balls, flatten into patties and make a an indentation in the center of each with your thumb, to keep burgers from doming while cooking. (cover and refrigerate up to 1 day). If planning on grilling on grill brush with olive oil before putting in refrigerator. Grill over med heat 10-15 min total flipping patties once (for medium thermometer should read 160 degrees) You may also cook in skillet in the house but do not put olive oil as they will produce enough grease themselves. Option: you can grill some onion to put on top of your burgers, add crumbled feta cheese before putting in a bun. Here are some of the things I do differently than the recipe below. I prefer to cup the potatoes up small (1/2"-3/4") than boil them and since we like to have some solid potatoes I mash 1/2 of them and leave the rest whole. I like to saute the onions and cook them in a little butter before putting them in the soup. I also like to use my own dried cayenne peppers, I have to be very careful to not use any seeds and I only put one or two of the small ones in, if I have a large one I only use half of it. I also use dried celery leaves from our own plants instead of celery salt and I rarely use parsley. I also like to make the rue (flour & butter) near the end of cooking and add it. I also prefer to put the pot in the oven and cook it there instead of the stove top. I tend to get rather busy and the soup is less likely to burn on the bottom if I put it in the oven. The recipe has no temperature because it came out of a 19th century cook book. This soup tends to be thick. I think some of the milk that I used was 2-5 months old (it was milk from a cow share program I belonged to). This is a crazy time of year for many of the vegetable farms. We want to give all our produce as long of a season to grow as possible yet we need to harvest many crops before the frost rolls in and kills the crops. This year with all the rains the ground has been extremely wet and very challenging to dig, so each day we chew our nails a little and each day we panic (or at least I do). Should we wait for a dry day when we have time to dig or take a chance that the frost will kill the produce? The biggest worry is the sweet potatoes because they are so sensitive, even if the tubers are below ground they are affected by the cold temperatures. Other crops that are outside may need to be covered in the past prior to our hoop-houses I was robbing the beds of sheets and blankets to save the plants. The worst nights are always when the moon is full and there is no cloud cover. When the wind is blowing and the plants are wet they are somewhat protected from the frost. Flour news here at Westwind…..
it was before. Still unbleached, nothing’s added, it just looks whiter and feels finer. Did you know that a company can have Organic in the name of their business, product name, trade name and have absolutely no organic ingredients in their products. This is one of those things that drive most Certified Organic Growers insane. If you look closely at some product names you may see a TM or an R next to their product but you will not find the USDA certified organic symbol. We actually turned down a producer for using Miracle Grow Organic Choice potting soil, they were convinced it was approved for Certified Organic use yet it is not and does not carry the USDA Organic Symbol and the company (Miracle Grow)said the process was too expensive. I do believe they do have some products that are USDA approved but not the product the grower was using. Thank you to John for the added treat to the customers bags, they got extra chips to try! John Simmons gets excited about each new flavor of tortilla chips he makes. He often wants to share his excitement so he shares bags of chips randomly to current customers or to people who have never tried his chips. During this last order cycle all those that placed an order for his chips received two free bags of chips, flavors that they probably have not tried yet. I would sure love to see the smile on their face when they realize the bonus. John gave me some chips to share with Jim and Pat Graham. When I was at their farm serious faced Jim, tired from a long day of working while tending to a minor wound was presented with John’s Chips; a big smile came across his face. Maybe in your next order John will be generous and give a free bag of chips. Rebekah’s Pure Living is having a Grand Opening. Great things are planned for that day. Taste test some of the great products and learn more about improving your health. The big event is Saturday September 20th from 1pm to 5pm. Giveaways and Gift Baskets, US 103 Radio On-Site with Carl Coffey and CranioSacral Institute of Michigan NES miHealth Scans. 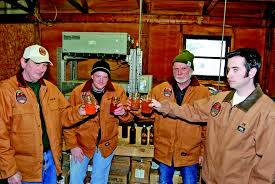 Jim Kohn and others have tasted the first fresh pressed cider of the year. The apple blend from the first early apples tends to be a little more tart than sweet. As the apples are harvested and sorted the blend of apples used will be sweeter. They have won awards for some of their superior blending of apples. They now have two varieties available for purchase and promise to be able to make available at least 10 or more varieties of apples. The apples are hand picked, sorted and never touch the ground. Currently available are the Ginger Golds and the Paula Reds. We have two new distribution locations, both of them are great locations. Weeks Meat Market in Richmond is a nice fairly new Market that has many Michigan and locally produced products. They have available hours for pick-up on Fridays and Saturdays. The other one is The Little Mustard Seed Cafe a small cafe that specializes in a local organic and gluten free menu. They are using some of our produce on their menu. Both locations are awesome and we are grateful that we managed to connect with them. Thanks to all those that voted for our new look over a year ago. We are getting another new look. Chris an intern who visited White Pine Farm designed this look. It has some great advantages in that the font is easier to read, we have a wider screen from which we can fit more text and a nicer easier to read calender. Next week be prepared for the new look.